Colorectal cancer is the third most common cause of cancer-related death in both men and women in the western hemisphere. According to the American Cancer Society, an estimated 105,500 new cases of colon cancer with 57,100 deaths will occur in the U.S. in 2003, accounting for about 10% of cancer deaths. Among the colon cancer patients, hereditary risk contributes approximately 20%. The main inherited colorectal cancers are the familial adenomatous polyposis (FAP) and the hereditary nonpolyposis colorectal cancers (HNPCC). The FAP and HNPCC are caused due to mutations in the adenomatous polyposis coli (APC) and DNA mismatch repair (MMR) genes. 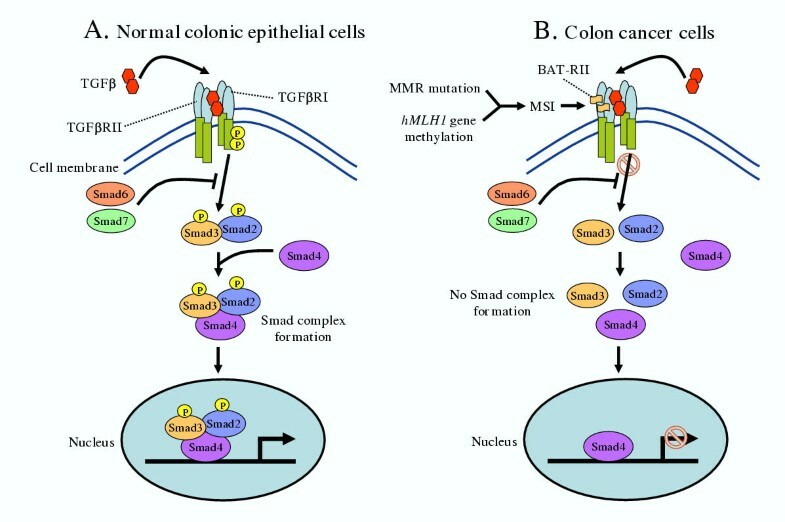 The focus of this review is to summarize the functions of APC and MMR gene products in the development of colorectal cancers. Prognosis of colorectal cancer depends on the stage of the tumor at the time of diagnosis, with surgery being the most effective treatment. Colorectal cancers develop through a series of histological distinct stages from "adenoma to carcinoma" . Recently, the multi-step model of colon cancer development by Fearon and Vogelstein  is revised and presented in greater detail to include the interdependence of different pathways and involvement of many more gene mutations than before [3, 4]. Genes which are mutated at different stages of colorectal cancer development include tumor suppressor genes, proto-oncogenes, DNA repair genes, growth factors and their receptor genes, cell cycle checkpoint genes, and apoptosis-related genes (Fig. 1). In contrast to the predictions of sequential mutation accumulation of genes (Fig. 1), a recent study presented a quite different view in which the gene mutation spectrum in a large cohort of colon cancer patients was correlative to only 6.6% . The heterogeneous pattern of tumor mutations found in this study suggests that multiple alternative genetic pathways to colorectal cancer exist and that the widely accepted genetic model of cancer development is not representative of the majority of colorectal tumors. However, it is believed that mutations in one of these genes set the stage for initiation and transformation of the normal colonic epithelial cells. Further accumulation of mutations in other genes then contributes to the progression of cancer through adenoma – carcinoma – metastasis stages. During accumulation of genetic changes, a complex signaling network is established among inactivated and activated cellular pathways. Many cells bearing defective signaling pathways may go through programmed cell death or apoptosis and may be removed from the normal population of cells; however, one of the target cells can go through the selection process and survive among other cells by overruling cell cycle checkpoints and abrogating apoptosis pathways. After clonal expansion, the genetically modified single cell can become a full grown tumor. Model for genetic alterations in the development of colorectal cancer. Based on genetic analysis, at least two pathways are characterized in detail, which lead to colon cancer development. One pathway (indicated with red arrows) initiates with mutations in the adenomatous polyposis (APC) gene and chromosomal instability (CIN) followed by mutations in K-ras, deleted in colorectal cancer (DCC) and p53 genes. The second pathway (indicated with blue arrows) is initiated by the mutations in the mismatch repair (MMR) genes and microsatellite instability (MSI) followed by mutations in hMSH3, hMSH6, TGFβIIR, IGFIIR, PTEN, BLM, Tcf-4, Bax and E2F4 genes. Other pathways are less characterized, but a high degree of overlapping is expected among them. At least, seven gene mutations are needed to develop a normal epithelial cell into carcinoma. However, a cluster of gene and chromosome aberrations such as p15, p16, Bub1, cyclin D1, tPa, CEA, Nm23, MMP, E-cadherin (CDH1), CD44, 7q, 14q, 22q and 8p are observed in carcinoma and metastatic tumors. ASEF, APC-stimulated guanine nucleotide exchange factor; DLG, Drosophila discs large; EB1, end-binding protein 1, KAP3A, kinesin superfamily-associated protein 3A; MCR, mutator cluster region; NES, nuclear export signal; NLS, nuclear localization signal; PP2-B56α, protein phosphates 2A B56α subunit. This figure is adapted from reference . 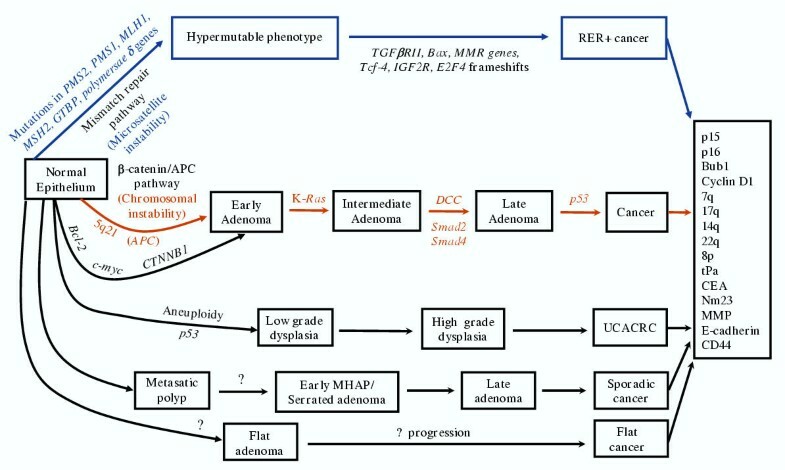 Mutations in the APC gene on chromosome 5q21 locus are considered as one of the earliest events in the initiation and progression of colorectal cancer. In FAP patients, allelic mutation of the APC gene followed by a loss of heterozygosity (LOH) is a common feature. Notably, mutations in the APC gene also are found in 60 to 80% of sporadic colorectal cancers and adenomas. FAP patients with APC mutations are prone to hundreds to thousands of colorectal adenomas and early onset carcinoma. FAP patients also are prone to small intestinal adenomas (and carcinomas), intra-abdominal desmoids and osteomas tumors (Gardner's syndrome), congenital hypertrophy of retinal pigment epithelium (CHRPE), fundic gland polyps in the stomach, pancreas and thyroid, dental abnormalities, and epidermal cysts [6, 7]. Mutations in APC are also associated with malignant brain tumors known as Turcot's syndrome . The APC locus on chromosome 5q21 shows loss of heterozygosity (LOH) in approximately 25% of breast cancers . Approximately 18% of somatic breast cancers carry APC gene mutations . Furthermore, LOH at the APC gene locus is frequently seen in the early stages of non-small cell lung cancers . In an animal model for carcinogen-induced lung tumors, a decrease in APC gene expression, rather than an increase in APC mutations, has been shown to be associated with tumorigenesis . The diverse effects of mutations in APC gene indicates that this molecule plays a key role in the regulation of cell growth in a number of colonic and extra-colonic tissues. It has been suggested that the overexpression of APC causes a G1/S phase checkpoint in serum-treated NIH-3T3 cells via components of the pRB pathway . A role for APC in the G2/M phase transition is also expected, given that APC is hyperphosphorylated during M-phase and is a target of the M-phase kinase p34Cdc2 [14, 15]. In a recent study, a direct role of APC in S and G2 phase arrest of cell cycle has been described in cell lines immortalized mouse epidermal keratinocytes, immortalized canine kidney epithelial, mouse squamous cell carcinoma and skin papilloma, and human colon carcimona . APC is expressed constitutively within the normal colonic epithelium. The APC gene product is a 310 kDa protein localized in both the cytoplasm and the nucleus. Recently, it has been shown that the APC gene is inducible, which is transcriptionally up-regulated by p53 in response to DNA damage [17–19]. p53 is a negative regulator of normal cell growth and division. Although mutations in the p53 gene is also widely present in colorectal cancers, its consequence on the expression of the wild-type or mutant APC gene is not clear . In an earlier study, in the ApcMin/+(Min, multiple intestinal neoplasia) mice model, an increased multiplicity and invasiveness of intestinal adenomas was associated with deficiency for p53 . Also, the occurrence of desmoid fibromas in these mice was strongly enhanced by p53 deficiency. The structure of the APC protein with different protein interaction domains are given in Figure 2. At the N-terminal site, the APC protein contains oligomerization and Armadillo-repeat binding domains; and at the C-terminal site there are EB1 and tumor suppressor protein DLG binding domains. The APC protein also contains three 15-amino acids and seven 20-amino acids repeat regions in which the latter is involved in the negative regulation of β-catenin protein levels in cells (Fig. 2). The first 20-amino acid-repeat in the APC gene is located at the 5'-end of the mutation cluster region (MCR). An association has been shown between severe polyposis phenotype and germ-line mutations in the MCR [21–24]. Selective pressure for an MCR mutant has been proposed based on the germ-line mutation in FAP . Patients with mutations outside of the MCR region have a milder phenotype. A recent study has shown that animals with homozygous truncating mutations at codon 1638 of APC did not develop tumors and survived through adulthood . Structural features of the APC protein. Most of the mutations in APC occur in the mutator cluster region (MCR) and create truncated proteins. The truncated proteins contain ASEF and β-catenin binding sites in the armadillo-repeat domain but looses the β-catenin regulatory activity which is located in the 20-amino acids repeat domain. Somatic mutations are selected more frequently in FAP patients with germ-line mutations outside of the MCR. It has been reported recently that APC functions as a nuclear-cytoplasmic shuttling protein and as a β-catenin chaperone [27–31]. There are at least five APC nuclear export signals (NESs). Among them, two are Rev-type NESs located at the N-terminal region and the other three are located in the 20-amino acid repeat region of β-catenin binding motif [29, 32]. The nuclear export of APC is mediated by CRM1/Exportin receptor pathway [28–30, 33]. The APC protein has two nuclear localization signals, NLS1 (1767–1772; amino acids GKKKKP) and NLS2 (2048–2053; amino acids PKKKKP). The nuclear localization of APC is controlled by post-translational modification of NLS residues by protein kinase 2 and/or protein kinase A [32–34]. APC may act as a negative regulator of β-catenin signaling in the transformation of colonic epithelial cells and in melanoma progression [35–37]. The role of the Wingless/Wnt signaling pathway has been described in Drosophila, Xenopus, and in vertebrates. This pathway is important in organ development, cellular proliferation, morphology, motility, and the fate of embryonic cells [38–40]. In a simple model shown in Figure 3, Wingless/Wnt signaling regulates the assembly of a complex consisting of: axin (and its homologs Axinl and conductin), APC, β-catenin, and glycogen synthase-3β kinase (GSK3β). Axin (Axil/conductin) binds to form a complex with APC, β-catenin, and GSK3β to promote β-catenin phosphorylation and subsequent binding with slim (β-TrCP) which mediates its ubiquitination and degradation in the proteasome [41, 42]. GSK3β regulates this process by phosphorylating β-catenin, APC and Axin (Axil/conductin) complex [43–45]. Activation of the Wingless/Wnt signaling pathway inhibits GSK3β and stabilizes β-catenin [46, 47]. Mutations of β-catenin or truncation of APC, which occur both in colon cancer and melanoma cells, increases the stability and transcriptional activity of β-catenin [37, 48]. The stabilized pool of β-catenin associates with members of the T-cell factor (Tcf)-lymphoid enhancer factor (Lef) family of transcription factors. There are four known members of the Tcf and Lef family in mammals, one of which, the human Tcf4 gene, is expressed specifically in colon cancer cells . The β-catenin/Tcf4 complex regulates the proto-oncogene and cell cycle regulator c-myc , the G1/S-regulating cyclin D1 , the gene encoding the matrix-degrading metalloproteinase, matrysin , the AP-1 transcription factors c-jun and fra-1; and the urokinase-type plasminogen activator receptor gene . From this discussion, it is clear that the inactivation of APC causes activation of β-catenin, which results in the constitutive activation of Tcf/Lef response genes. A model for the Wnt-signaling pathway. Panel A depicts the down-regulation of β-catenin transactivation activity in normal colonic epithelial cells. β-catenin remains in a complex of Axin/Axil/conductin, APC, GSK3β kinase and casein kinase 1 or 2 (CK1 or 2). In the absence of Wnt-signaling, GSK3β and CK1 or 2 kinases become active and phosphorylate β-catenin at serine and threonine residues in the N-terminal domain. Axin and APC promote phosphorylation of β-catenin by acting as a scaffoled protein and bringing together enzyme(s) and substrate(s). The phosphorylated β-catenin then binds with F-box protein β-TrCP of the Skp1-Cullin-F-box (SCF) complex of ubiquitin ligases and undergoes proteasomal degradation. Even though Tcf-Lef transcription factor without β-catenin may bind to DNA in the absence of β-catenin, the repressors and corepressors such as CtBP (carboxy-terminal binding protein), CBP (CREB-binding protein), Gro (Groucho), LRP (LDL-receptor-related protein) bind with Tcf-Lef and repress c-myc or cyclin D1 gene expression to control cell cycle progression. Some other known genes which are regulated by β-catenin/Tcf-Lef pathway are given here – cyclin D1, CDH1, Tcf-1, c-jun, Fra-1, PPARd, Gastrin, uPAR, MMP7, Conductin, CD44, Id2, Siamois, Xbra, Twin and Ubx. Panel B shows the role of mutations in the APC or β-catenin protein in the regulation of β-catenin level and its transactivation property in colon cancer cells. The mutant β-catenin escapes its degradation through Wnt-pathway and becomes stabilized in the cytoplasm. The stabilized level of β-catenin then heterodimerizes with Tcf-Lef transcription factor and locates into the nucleus, where it actively transcribes cell cycle related genes causing cellular proliferation. The binding of β-catenin with Tcf-Lef inhibits the binding of CtBP, CBP, Gro or LRP and potentiates its transcriptional activity. In many cases, it has been observed that colon tumors carrying mutations in the APC gene also carried increased levels of c-Myc, a known factor for cellular proliferation. Recently, a direct link has been established between APC gene mutation, β-catenin activation and c-myc gene up-regulation in colon cancer development. The increased expression of c-Myc through Wnt-signaling pathway up-regulates the expression of Cdk4 gene, whose product is responsible for cell cycle regulation in G1 phase . The c-myc gene encodes a transcription factor of helix-loop-helix leucine zipper family that binds as a heterodimer with Max to E boxes (CACGTG) on target promoters, for example Cdk4 gene, and activates its expression. Max can also interact with Mad and Mxi1 and down-regulate c-Myc target gene expression. It has been suggested that the increased levels of Cdk4 protein can phosphorylate pRB. The E2F/DP transcription factor then dissociates from the hyperphosphorylated pRB, which actively transcribes genes involved in cell cycle progression through G1 phase. It is also suggested that the increased levels of Cdk4 may sequester cell cycle kinase inhibitor p21, p27, and p16. This sequestration may account for the ability of c-Myc overexpression to substitute for p16 deficiency as noted in mouse fibroblast transformation . These studies thus establish a link among APC gene mutation, β-catenin stabilization, c-myc gene activation, and Cdk4/cyclin D1/pRB/p16 pathway in colorectal cancer development. Actin cytoskeletal integrity is necessary to maintain the shape and adherence junctions of cells. The imbalance in actin cytoskeletal integrity can cause disturbance in cell-cell adhesion and cell migration. The role of APC in actin cytoskeletal maintenance is predicted through its interaction with β-catenin. β-catenin establishes a link between APC and actin by providing a bridge to α-catenin . In Drosophila, mutations in E-APC have shown to affect the organization of adherence junctions [54–56]. Another link of APC with actin is shown through its interaction with PDZ domain of DLG protein. Since APC co-localizes with DLG in the cytoplasm in rat colon epithelial cells, the APC-DLG complex may participate in regulation of cell cycle progression . Mutant APC lacking the S/TXV motif for DLG binding exhibits weaker cell cycle blocking activity at Go/G1 phase than the intact APC . Interaction of APC with β-catenin and through β-catenin interaction with the members of the cadherin family of proteins have been implicated in cell-cell adhesion [24, 59]. As shown in Figure 4, the C-terminal domain of E-cadherin interacts with β- and γ-catenin, which associate with α-catenin and form an E-cadherin complex with actin cytoskeleton. This complex maintains the stable cell-cell adhesion . APC becomes a part of the cell-cell adhesion complex linked with E-cadherin, since it directly binds with β-catenin, γ-catenin, and actin filament [24, 60]. The tyrosine phosphorylation of β-catenin by epidermal growth factor (EGF), hepatocyte growth factor (HGF) and c-Met receptors is important in modulating cadherin-catenin complexes from membrane bound form to free cytosolic form . The phosphorylation of β-catenin at tyrosine residue, which is blocked by tyrosine phosphatase Pez, is involved in epithelial cell migration . If the Wnt-pathway and the EGFR or c-Met receptors pathway are activated at the same time, then the degradation of β-catenin can be inhibited and it may translocate to the nucleus, bind to the Lef-Tcf transcription factor, and down-regulate the transcription of E-cadherin gene, CDH1, expression . These complex interactions may finally result in the reduction in E-cadherin-mediated cell-cell adhesion and proliferation of cells [64–66]. Mutations in APC gene impair actin cytoskeletal integrity, cell-cell adhesion and cell migration properties of colon cancer cells. Panel A shows the organization of cell-cell adhesion and cytoskeletal proteins in normal colonic epithelial cells. The APC gene product is shown to bind through its armadillo repeat domain to ASEF. Endogenous APC co-localizes with ASEF in colonic epithelial cells. APC regulates guanine nucleotide exchange factor (GEF) activity of ASEF and maintains actin cytoskeletal network, cell-cell adhesion and cell migration. Panel B shows how mutations in the APC gene product may impair actin cytoskeletal network, cell-cell adhesion and cell migration properties of colon cancer cells. Mutations in APC gene product disrupt binding with actin and β-catenin; thus it affects actin cytoskeletal network and cell-cell adhesion, respectively. ASEF binds with most APC mutant proteins containing armadillo repeat sites, stimulates its own GEF activity, and promotes cell migration. Another important role for APC is assigned in cell migration. Colonic epithelial cells, derived from a committed stem cell, divide in the lower two-third of the crypts and migrate rapidly to the surface to form a single layer. During migration, they are differentiated into absorptive, secretory, paneth and endocrine cells. The function of a wild-type APC is necessary in maintaining the direction of upward movement of these cells along the crypt-villus axis. Loss of wild-type APC functions due to loss of expression or mutations affect cell migration. These cells, instead of migrating upwards towards the gut lumen, migrate aberrantly or less efficiently towards the crypt base where they accumulate and form polyps . In due time, these cells become aneuploid due to defects in chromosome segregation as well as acquiring β-catenin stabilization and activation of genes for cell proliferation. The mechanisms by which APC might be involved in cell migration can be understood by its association with the kinesin superfamily-associated protein KAP3 that has been established in cell-cell adhesion and migration. It has been shown that APC, mediated by KAP3, interacts with kinesin motor proteins which transport it as well as β-catenin along the microtubules to the growing ends of the cytoskeletal protruding into motile cell membranes [68, 69]. At the tip of the microtubule, APC interacts with the end-binding protein EB1 and protein tyrosine phosphatase PTP-BL. PTP-BL modulates the steady state levels of tyrosine phosphorylations of APC associated proteins such as β-catenin and GSK3β. In fact, GSK3β kinase activity has been implicated in microtubule dynamics [70, 71]. Recently, experimental evidence was presented describing the mechanisms by which the mutated APC might play a role in the migration of colorectal tumor cells [72, 73]. In these studies, an interaction of APC has been shown with APC-stimulated guanine nucleotide exchange factor (ASEF) that may regulate the actin cytoskeletal network . APC binds with ASEF and controls its activity. ASEF is activated in colorectal cancer cells containing truncated APC. Active ASEF decreases E-cadherin-mediated cell-cell adhesion and promotes cell migration. Thus, the dynamic association of APC, EB1, ASEF, catenins, EGFR or c-Met receptor, PTP-BL and E-cadherin proteins at cell-cell adherence junctions and microtubule ends play an important role in cell-cell communication, cell migration and carcinogenesis. Both sporadic and hereditary colorectal cancers exhibit a defined set of biological and genetic cell heterogeneity through a series of molecular events. Two specific pathologically distinct genetic pathways for colorectal cancer have been identified – the chromosomal instability (CIN) pathway and the microsatellite instability (MSI) pathway. The CIN and MSI are associated with two major inherited syndromes, familial adenomatous polyposis (FAP) and hereditary non-polyposis colorectal cancer (HNPCC), respectively. The MSI leads to a 1,000-fold increase in the rate of subtle DNA changes, whereas CIN enhances the rate at which gross chromosomal changes occur during cell division such as chromosome breaks, duplication, rearrangements, and deletions. The latest findings describing these two pathways are discussed below. Aneuploidy, the abnormal number of chromosomes both quantitatively and qualitatively, is proposed to be a common characteristic of colon cancer cells. It is believed that the aneuploidy in colon cancer cells arises during mitosis through a defective cell division leading to CIN. CIN is a common feature of about 85% colorectal cancers, and it has been detected in the smallest adenoma, suggesting that CIN may occur at very early stages of colorectal cancer development. The mechanism(s) by which CIN is generated in colon cancer cells is largely unclear. Since the main feature of CIN is aneuploidy, it has been predicted that it may arise due to structural changes to the chromosomes and abnormal mitosis. In the year 2001, two different research groups linked mutations in APC gene with CIN [74, 75]. 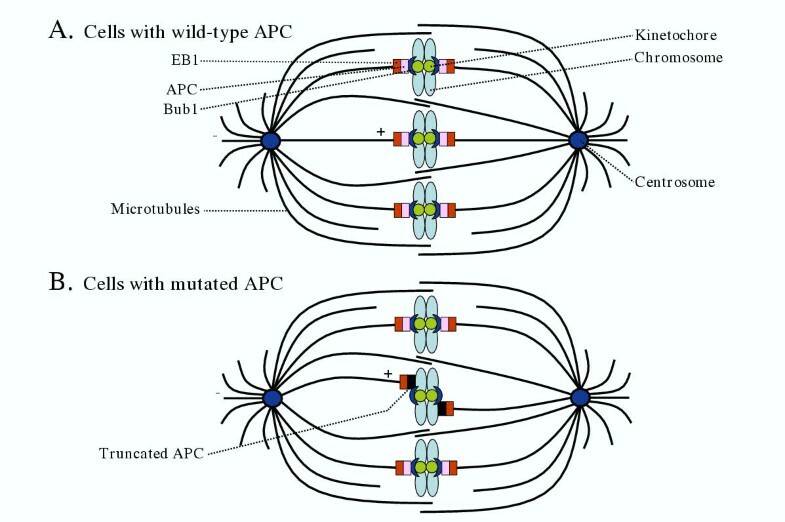 Their results suggested that the wild-type APC may be involved in maintaining the proper connection of microtubules with chromosomes. APC performs a bridging function between microtubules and chromosomes. APC binds at the plus end of the microtubule through EB1, stretches it to the chromosomes, and inserts them into kinetochores after binding with Bub1. APC co-localizes to kinetochores and form complexes with Bub1 and Bub3, the two mitotic checkpoint proteins . The successful complex formation may facilitate proper growth of spindle formation and helps in maintaining euploidy (Fig. 5A). 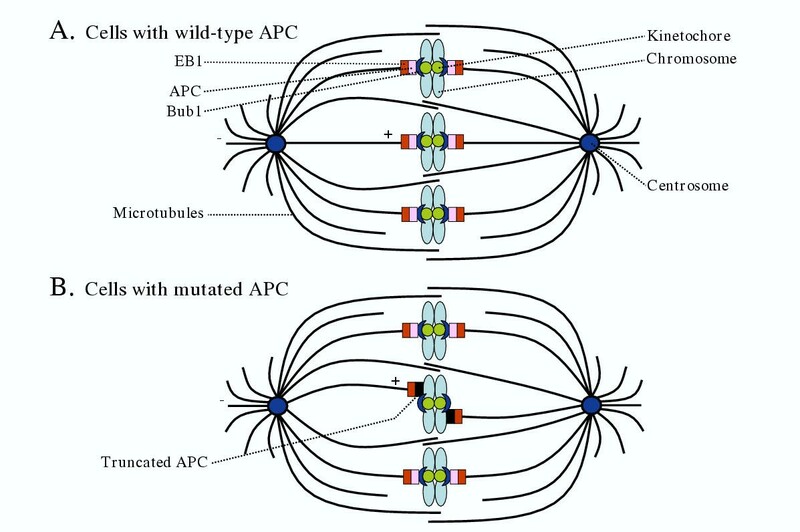 Once the APC gene is mutated, the truncated APC protein may loose its ability to bind with Bub1, and it may become unable to properly maintain the attachment of microtubules at kinetochores, resulting in defect in segregation of chromosomes (Fig. 5B). Chromosomal instability (CIN) in cells carrying mutations in APC gene. Panel A shows a model for the interaction of APC with plus-end of microtubule through EB1 and with kinetochore of chromosome through Bub1 in normal colonic epithelial cells. APC can also bind microtubules directly via the C-terminal basic domain. Panel B shows a disruption in the interaction between spindle microtubules and kinetochores due to expression of truncated form of APC in colon cancer cells. These studies also pointed out another interesting observation associated with CIN. It has been found that after blocking apoptosis in either ApcMin/+or Apc1638T ES cells, the number of aberrant chromosomes were much greater than in control ES cells that were unable to undergo apoptosis . From these results, a multiple-hit hypothesis of colorectal cancer development has been suggested. The chromosome segregation defect in colon cancer cells with mutated APC gene could lie dormant until an additional genetic-hit suppresses the mitotic checkpoint or the apoptosis of defective cells. In this regard, the proper functioning of the hSecurin, a protein which is necessary for the completion of the anaphase portion of mitosis, is critical to maintain euploidy, since the loss of hSecurin is often associated with the loss of chromosomes at a high frequency . Furthermore, telomere dysfunction has been shown to promote CIN that triggered early carcinogenesis in the ApcMin/+Terc-/- mouse models, while telomerase activation restored genomic stability to a level permissive for tumor progression . These studies suggested that early and transient telomere dysfunction is a major mechanism underlying CIN of human cancer. Thus, multiple factors may play together in colorectal cancer development from normal epithelial cells – adenoma – carcinoma stages. Microsatellite instability (MSI) is characterized by the size variation of microsatellites in tumor DNA as compared to matching normal DNA due to defects in the mismatch repair (MMR) system. MMR system is critical for the maintenance of genomic stability. MMR increases the fidelity of DNA replication by identifying and excising single-base mismatches and insertion-deletion loops that may arise during DNA replication. Thus, the MMR system serves a DNA damage surveillance function by preventing incorrect base pairing or avoiding insertion-deletion loops by slippage of DNA polymerase . Once cells compromise with these functions, then it may lead to accumulation of mutations resulting in the initiation of cancer. The MMR genes are involved in one of the most prevalent cancer syndromes in humans known as hereditary nonpolyposis colon cancer (HNPCC) or Lynch syndrome . HNPCC is characterized as an autosomal dominant inherited disease with 85–90% gene penetrance for early-onset of colorectal carcinoma. HNPCC accounts for about 5–7% of cases of colorectal carcinoma. The molecular diagnosis of HNPCC is based on determining MMR genes for germ-line mutations. There are at least six different proteins required for the complete MMR system. These proteins are hMSH2, hMLH1, hPMS1, hPMS2, hMSH3 and hMSH6 (GTBP). Recently, mutational germ-line analysis of hMSH2 and hMLH1 genes has been suggested to cause early onset in colorectal cancer patients . hMSH2 forms a heterodimer with either hMSH6 or hMSH3 (depending on the type of lesion to be repaired) and binds to the mismatch site. The complex of hMSH2 with hMSH6 is called hMutSα, and it is required for the correction of single-base mispairs. The complex of hMSH2 with hMSH3 is called hMutSβ, and it is required for the correction of insertion-deletion loops . Subsequently, a heterodimer of hMLH1 and hPMS2 proteins are recruited by hMutSα or hMutSβ proteins to the mismatch recognition complex, which along with other proteins are involved in excision, resynthesis and ligation of DNA. Mutations in the hMLH1 and hPMS2 have been found in about 90% of HNPCC cases. Mutations in other MMR genes have been less frequent in HNPCC patients . In many sporadic colon cancers, hypermethylation of the hMLH1 gene promoter resulting in its transcriptional silencing has been observed more than mutations. Both mutations and methylation of hMLH1 gene have been linked with MSI playing a causal role in the initiation of colorectal cancer [82–84]. Recently, the CpG island methylator phenotype (CIMP) pathway has been suggested as a novel mutator pathway that predisposes to colonic tumorigenesis. In many cases of the sporadic colon cancers, the MSI can be induced by CIMP, followed by hMLH1 gene's promoter methylation, loss of hMLH1 gene expression, and resultant MMR deficiency . Mutation rate in cells with MMR deficiency are 100–1,000-fold greater than in normal cells. There are many targets of MMR gene inactivation; however, the precise stage of tumorigenesis in which mutation of the wild-type MMR gene occurs is not clear. There are few well studied gene targets of MMR, whose mutations in the microsatellite region have been found in gastrointestinal tumors. These gene targets are the transforming growth factor-β receptor II (TGFβRII), hMSH3, hMSH6, insulin like growth factor II receptor (IGFIIR), phosphatase and tension homologue deleted on chromosome ten gene (PTEN), caspase 5, Bloom (BLM) syndrome helicase, T-cell factor 4 (Tcf-4), the cell cycle regulator E2F4, and antiapoptotic gene Bax [86–95]. In colon cancers, transforming growth factor-β (TGFβ) signaling potently inhibits the growth of normal epithelial cells, since the tumor cells are frequently resistant to TGFβ; they cause pre-neoplastic lesions, increase motility and spread cancer. The structural basis for TGFβ resistance in colon cancers is defined due to somatic mutations that inactivate TGFβ receptor II (TGFβRII) . In human colon cancer cell lines with high rates of MSI, the mutations in the TGFβRII gene was found . These are primarily frameshift mutations that add or delete one or two adenine bases within or from 10 base-pair poly(A) repeat in the cysteine-rich coding region (codons 125–128) of the TGFβRII gene. Mutations in this region consist of 1- or 2-base deletions or insertions. The other microsatellite region in the TGFβRII gene is a poly(GT)3 that was found with insertion of an extra GT in this region [86, 96, 97]. These mutations produce truncated proteins that lack the cytoplasmic domain. As much as 90% of the colorectal cancers with MSI have the mutated TGFβRII gene. TGFβIIR responses are connected with Smads, tumor suppressor gene products, which help to initiate TGFβ-mediated gene transcription (Fig. 6). The transcriptional regulation of Type 1 plasminogen inhibitor (PAI-1) and cyclin dependent kinase inhibitor p15 genes are controlled by TGFβ signaling. PAI-1 is the primary inhibitor of tissue-type plasminogen activator (tPA) and urokinase-type 1 plasminogen activator (uPA) . TGFβ inhibits cell proliferation by inducing a G1-phase cell cycle arrest acting through increased expression of p15 . Thus, the loss of TGFβIIR or Smad4 can abolish TGFβ-signaling and advocate cell proliferation and development of colorectal cancer. In a mouse ApcMin/+mouse model, the combination of Smad4 and APC gene mutations have been shown to cause rapid tumor formation of the benign lesions arising only from the APC gene deficiency . These studies, reiterate the human data that put forward the hypothesis that mutations in the TGFIIR gene contribute to adenoma – carcinoma stage progression in colon. 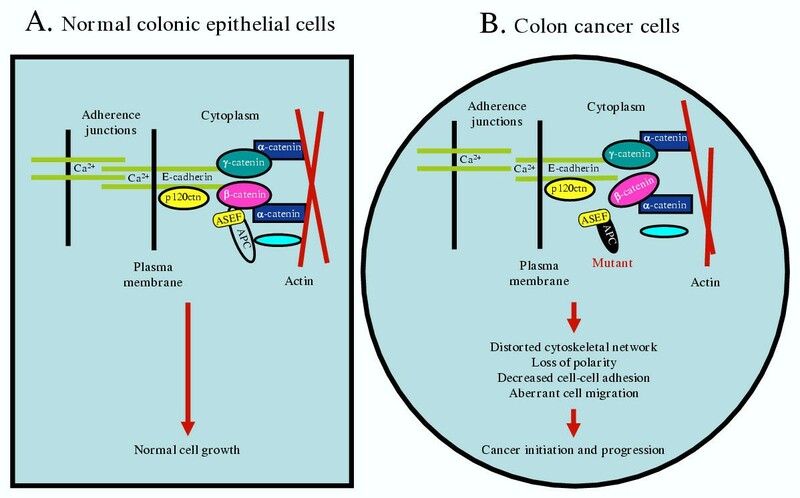 TGFβ signaling in normal colonic epithelium and cancer cells. Panel A describes the functional pathway of TGFβ signaling in normal colonic epithelial cells. TGFβ ligand binding with TGFβRII recruits TGFβRI into a tetrameric receptor complex resulting in transphosphorylation and activation of TGFβRI. After phosphorylation, the TGFβRI becomes an active kinase which phosphorylates Smad 2 and Smad3. SARA (Smad Anchor for Receptor Activation), a scaffolding protein facilitates interaction between Smad2, Smad3 and TGFβRI. Phosphorylated Smad2 and Smad3 allow the formation of homo- and heterodimerization complex, including Smad4. The Smad complex then translocates into nucleus, binds with DNA, and stimulates the expression of target genes including p15 (inhibitor of cell cycle kinase that controls cell cycle into G1 phase) and PAI-1 (inhibitor of protease 1 that degrades extracellular matrix proteins during metastasis). 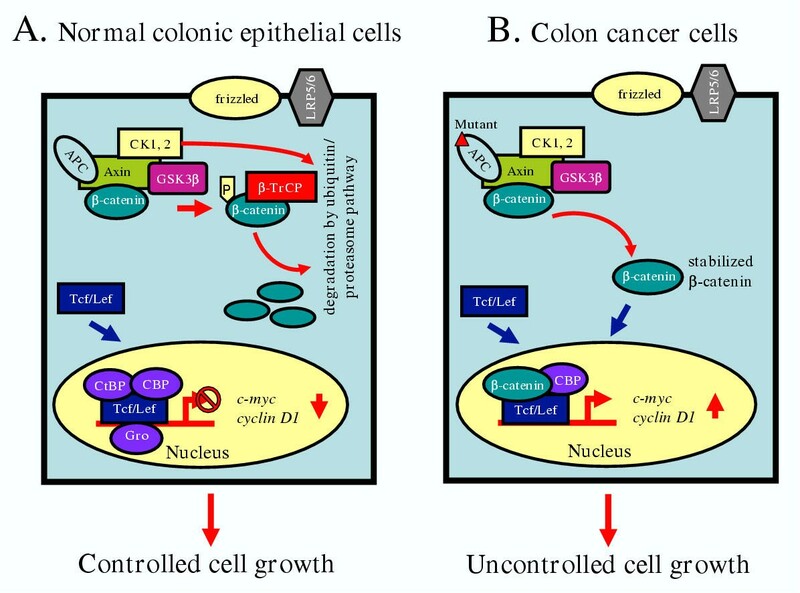 Panel B shows the abnormal pathway of TGFβ signaling in colon cancer cells. Many colon cancer cells with microsatellite instability (MSI) due to defective mismatch repair (MMR) activity induce mutations in TGFβRII gene. Often, these are frameshift mutations that insert or delete one or two adenine bases located within a 10 base-pair polyadenine repeat region (base-pairs 709–718, codons 125–128; referred to as BAT-RII) of TGFβRII gene. These mutations encode TGFβRII proteins truncated between 129 and 161 amino acids of the cytoplasmic domain which causes functional inactivation of these proteins. Thus, the loss of TGFβ signaling may abolish cell cycle control and induce metastasis of colon cancer cells by inhibiting p15 and PAI-1 genes expression, respectively. Insulin like growth factor II receptor (IGFIIR) plays a critical role in cell growth, survival and differentiation; however, once mutated, these receptors play a major role in tumorigenesis [101, 102]. The IGFIIR/mannose-6 phosphate receptor (M6PR) interacts with both IGF-II and latent TGFβ1 ligands and acts as a tumor growth suppressor . The IGFIIR performs its growth suppressive function by two different mechanisms. In one case, it binds and stimulates the plasmin-mediated cleavage and activation of the latent TGFβ1; in the second case, it participates in the internalization and degradation of its own ligand IGFII, a mitogen . The IGFIIR gene harbors several microsatellites within its coding region; one of them is poly(G)8 repeat which is often mutated with 1- or 2-base pair deletions or insertions. These mutations produce frameshifts and premature stop codons . Thus, the loss of IGFIIR function due to mutations in MSI cells may enhance cell proliferation due to accumulation and activation of IGFII and down-regulation of TGFβ1. The PTEN tumor suppressor gene, also known as mutated in multiple advanced cancers (MMAC) or TGFβ-regulated and epithelial cell-enriched phosphatase (TEP-1), is located on chromosome 10q23. A homologous deletion of this gene has been found in sporadic glioma, endometrial, melanoma, prostate, renal, meningioma and small cell lung carcinomas. Germ-line mutations in PTEN gene is linked with autosomal dominant inherited cancer syndromes such as Cowden's disease, Lhermitte-Duclos disease, and Bannqayan-Zonana syndrome, Bannayan-Riley-Ruvalcaba syndrome, Proteus syndrome, and Proteus-like syndromes [105–110]. In endometrial and colorectal cancers, the mutations in PTEN gene occur in MMR function-deficient cells [109, 111]. The coding region of the PTEN gene contains several microsallites, among which a repeat of poly(A)6 tract in exon 7 and 8 are most susceptible to frameshift mutations . PTEN is involved in cell cycle arrest and apoptosis through negatively regulating the survival signaling mediated by phosphatidylinositol 3-phsophate (PIP3) kinase (PI3K) and its down-stream target, a serine/threonine kinase Akt (also called protein kinase B) [113, 114]. Once cells receive signals through growth factors, hormones, or extracellular matrix components, the Akt is recruited by PIP3 to the plasma membrane, where it is phosphorylated at the Ser473/Thr308 . The phosphorylated Akt is involved in cell survival, proliferation and migration. Thus, the loss in PTEN causes elevation of intracellular PIP3 level that stimulates Akt kianse activity. The active Akt leads to tumorigenesis due to loss of proliferative and apoptotic controls of cell growth. The genetic data of PTEN gene mutations found in human tumors were further supported by animal studies. In a mouse model study, the PTEN-/- homozygous null mice was found to be embryonic lethal; however, the PTEN-/+ mice developed neoplasm in various organs, including breast, prostate, endometrium, adrenal, lymphoid, skin, colon, thyroid, liver and thymus . The ability of pRb to regulate cell cycle progression is dependent upon its interaction with E2F/DP family of transcription factors which are required for the regulation of a large number of genes involved in cell proliferation [117–119]. There are at least six E2F proteins which can be categorized into distinct subgroups that act in direct opposition to one another to promote either cellular proliferation or cell-cycle exit and terminal differentiation. The E2F1, E2F2 and E2F3 proteins can be grouped in one subgroup since they all directly interact with pRb and are strong transcriptional activators. The E2F4 and E2F5 proteins are comparatively less strong transcriptional activators or sometimes act as repressors by recruiting the pocket proteins (BOX 2) and their associated histone-modifying enzymes. The E2F6 acts as a repressor through its interaction with Bmi1-containing Polycom group of proteins [120–122]. The E2F4 and E2F5 transcription factors are also different than their other family members in that these factors lack the cyclin A binding domain. Furthermore, there is another critical feature in the E2F4 gene which is distinct from its family members. The coding region of the E2F4 gene contains a longer spacer segment of a repeated sequence of trinucleotide (CAG)13 that encodes 13 consecutive serine residues; this region is highly vulnerable to frameshift mutations in MSI cells. In MMR defective colorectal tumors, mutations in the E2F4 gene have been observed . Thus, defective E2F4 gene expression in MSI colon cancer cells can possibly promote cell cycle progression through Go/G1 transition. Approximately 50% of the tumors with MSI are found with mutations in the Bax gene. These mutations produce frameshift mutations within a coding region of eight nucleotide stretch of guanine residues (G8) [93, 123]. Bax heterodimerizes with anti-apoptotic protein Bcl2 and induces apoptosis. In the presence of apoptotic signals, BH3 domain proteins tBid are activated and bound with Bax. The interaction of tBid with Bax brings conformational changes in Bax, and this promotes its translocation to the mitochondria. Bax oligomerizes and inserts into the outer mitochondrial membrane where it forms channels to release cytochrome c (Cyt c) into the cytoplasm. The released Cyt c forms a complex called apoptosome with Apaf-1, dATP and pro-caspase 9 . The apoptosome recruits and processes pro-caspase 9 to form a holoenzyme complex, which in turn recruits and activates the effector caspases leading to apoptosis. Thus, the expression of mutated Bax protein may fail to release Cyt c and increase the Bax-Bcl2 ratio resulting in the escape from apoptosis and inducing initiation of colorectal carcinogenesis. Bloom syndrome (BS) is a rare autosomal recessive inherited cancer predisposition caused by inactivation of the RecQ family helicase, BLM [125, 126]. The genetic disorder of the BLM gene is characterized by growth deficiency, impaired fertility, proportional dwarfism, sun-sensitive telangiectatic erythema, immunodeficiency and premature ageing. The function of the BLM helicase is implicated in reinitiating DNA replication forks that are blocked at lesions, thereby promoting chromosome stability, which is characterized by elevated sister chromatid exchanges (SCEs), as well as chromosomal breaks, deletions, and rearrangements. Also, BLM helicases perform essential roles in genetic recombination, transcription, and DNA repair [127, 128]. In all the above systems, the helicase activities derive energy from hydrolysis of ATP. BLM is a part of BRCA1-associated genome surveillance complex (BASC) which includes MSH2, MHS6, MLH1, ATM, RAD50-MRE11-NBS1 complex, and replication factor C . BLM also interacts with heterotrimeric, single-stranded DNA binding protein, replication protein A (RPA), which after binding, stimulates BLM helicase activity . The genetic structure of the BLM gene coding region contains 4,437 base-pairs and encodes 1,417 amino acids. The BLM helicase has different motifs which are assigned to different activities. Motifs Ia, III and V contain residues that establish direct contact with ssDNA and motifs I, II-IV and VI form a pocket for binding ATP . It has been observed that many point mutations in BS patients are confined to these conserved helicase motifs, thus disrupting its ATPase and helicase activity. DNA sequencing from the sporadic gastrointestinal tumors showed abnormal bands caused by a deletion of one adenine residue in the poly-adenine tract (reduction from nine to eight adenines) in the coding region of the BLM gene [95, 132, 133]. Since these tumors had defective MMR genes, mutations in the BLM gene is directly linked with MSI and chromosomal instability pathways. Mutations in BLM gene has been associated with frameshifts in Bax, hMSH6 and/or hMSH3 with multiple unstable mono- and trinucleotide repeats located in coding regions that were significantly higher than that observed in microsatellite mutator phenotype positive tumors without BLM frameshifts. From these studies, it has been suggested that BLM loss of function by MSI in sporadic gastrointestinal tumors might be an intermediate mutational event, which may increase the instability of a pre-existent unstable genotype. In Figure 3, disruption of the APC/β-catenin pathway is shown as a critical step in the development of colorectal and other cancers. The oncogenic β-catenin translocates into nucleus, heterodimerizes with the Tcf/Lef family of proteins, and transcribes target genes. The transcription factor Tcf-4 is one of the Tcf-family proteins, which forms a transcription complex with β-catenin and plays an important role in maintenance of normal epithelial growth and development of colorectal tumors . The Tcf-4/β-catenin transcriptional activity is inhibited by protein Icat (inhibitor of β-catenin and Tcf-4), which blocks the interaction between β-catenin and Tcf-4 and thereby antagonizes Wnt-signaling . Since the APC/Tcf-Lef/β-catenin pathway plays an important role in colorectal cancer development, mutational analysis of these genes is critical to evaluate their functions. The mutations and their consequences in APC and CTTNB (β-catenin) genes are discussed earlier, which are characteristics of CIN. However, the mutations in the Tcf-4 gene were found in MSI cells [135–137]. In MSI cells, an error-prone poly(A)9 monorepeat in exon 17 of the Tcf-4 gene frequently shows frameshift mutations by deletion of one nucleotide producing a short and medium isoform of the Tcf-4 protein. The transactivating properties of these shorter Tcf-4 isoforms in the development of colorectal cancers are still not clear. Recently, it has been suggested that the frameshift mutations in the poly(A)9 region of the Tcf-4 gene may in fact produce a gain in function of the shorter Tcf-4 isoform due to loss of binding sites of the transcriptional suppressor molecules, CtBP or Grg/TLE [138–140]. These mutated Tcf-4 proteins also lose the binding of chromatin remodeling complexes containing Osa/Brahma . Thus, based on these studies, it is expected that mutated Tcf-4 protein may acquire increased transcriptional activity by increased binding affinity for β-catenin or by facilitating the structural organization of chromatin . Finally, it has been suggested that mutations in the Tcf-4 gene may not have significant effect and thus it may contribute marginally to the colorectal carcinogenesis or act as passenger mutations . Development of colorectal cancer is a complex and multi-step process in which several gene defects coordinate with each other in genotypic and phenotypic outcome. Mutations in many tumor suppressor and proto-oncogenes in the development of sporadic and hereditary colorectal cancers are well established; however, their precise role in this process is still not clear. For example, it is now established that mutations in the APC gene may be necessary for the early onset of FAP. Mutations in the APC gene perhaps set a stage for mutations in other genes such as K-ras, DCC, and p53. However, the mechanism(s) by which APC gene mutations may contribute to the accumulation of mutations in these genes that are associated with the colon cancer progression remains unclear. Mutations in the MMR genes can be linked to increased rate of mutations; however, studies indicate that MMR negative cells develop resistance to apoptosis rather than accumulation of mutations. Thus, MMR gene mutations and its role in MSI and apoptosis need further investigation in context with apoptosis and cell cycle-related genes. These studies will provide a better understanding of colorectal cancer development and its intervention by genetic or chemotherapeutic means. The work in our laboratory on APC is currently supported to S. N. by NCI-NIH (CA-097031, CA-100247) and Flight Attendants Medical Research Institute, Miami, FL. I thank the members of my laboratory for their comments and to Nirupama Gupta and Mary Wall for their critical reading of this manuscript. I apologize to those colleagues whose work was not cited; instead, many of them have been accommodated in referenced review articles. SN drafted the paper. DR provided suggestions for its finalization. Both authors read and approved the final version of the manuscript.